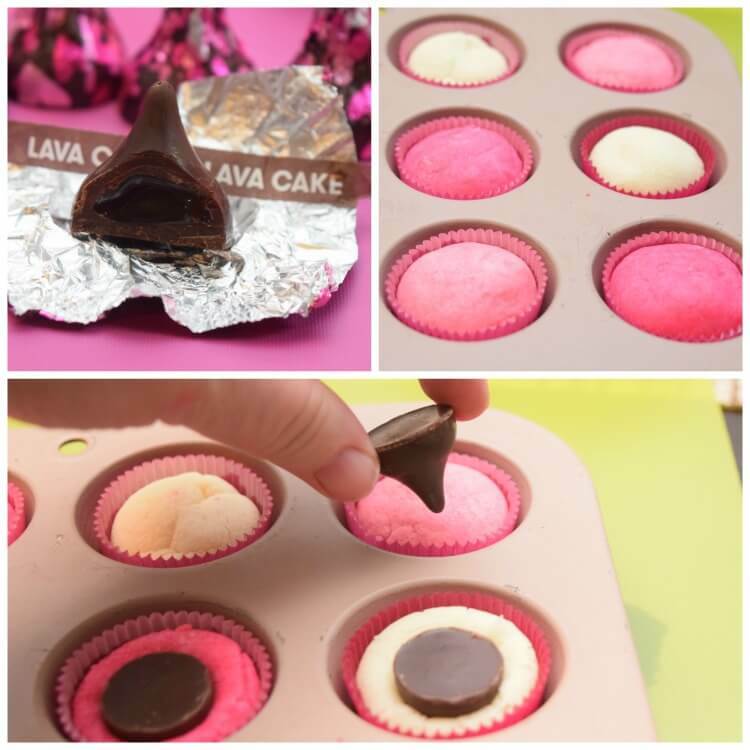 Have you seen the new HERSHEY”S Lava Cake KISSES? They have molten chocolate in the middle and are dee-licious! 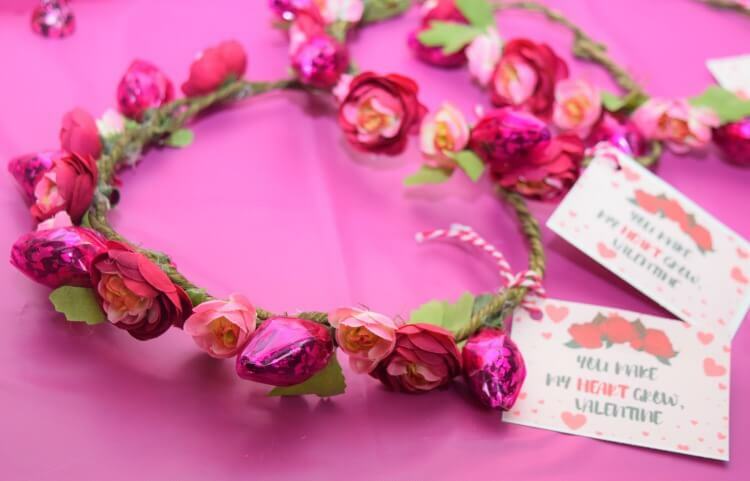 Yesterday I shared a lovely Galentine’s Day craft to make with these HERSHEYS Lava Cake KISSES. Today I’ve got a cookie that explodes in your mouth made with the new Lava Cake KISSES that you are going to love! But…let me warn you, when you take a bite, do it delicately because that molten chocolate, even when the cookies are totally cooled off, will make a little ol’ gooey mess when you bite if you’re not careful. Everybody who had one got that little surprise when they first bit into their cookie. I used different pink dyes, a lighter one and a darker more fuchsia one, and then I kept a third of the dough just regular sugar cookie color. I’ve made these a few times, and I prefer to color the dough in the mixer. It’s less work for me. But, you can also use disposable gloves and knead the dough to get the color. 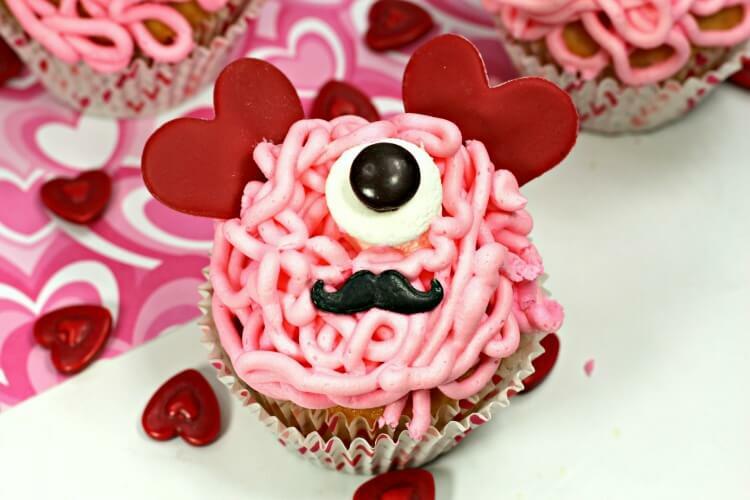 These are made in mini muffin tins with mini cupcake liners. 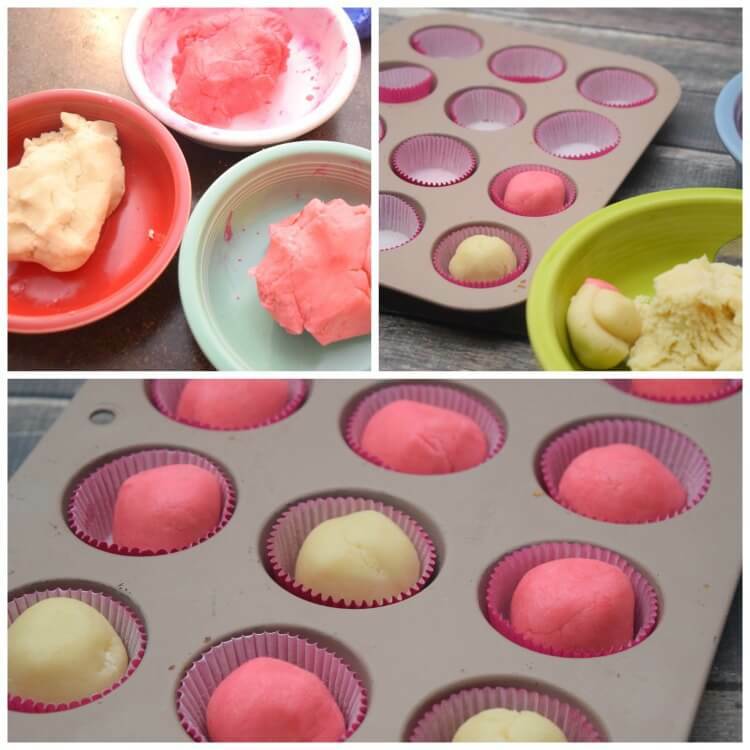 You’ll roll balls of dough with about a tablespoon of dough and put each ball into a cupcake liner. This part took some trial and error as I’ve made these a few times and finally figured out what worked best. If you’re going to use the regular solid HERSHEYS KISSES, you don’t need to freeze the cookies. 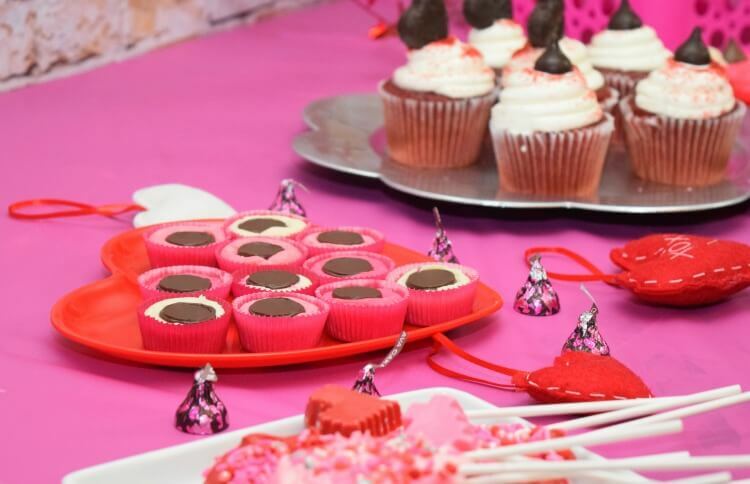 But…if you use these new lava cake kisses, then you’ll need to wait until the cookies have cooled for 3-4 minutes before inserting chocolates. You’ll insert the chocolate kisses upside down, and immediately pop them in the freezer. Otherwise, the liquid chocolate inside the Lava Cake Kisses makes the whole entire kiss turn melty on top of the cookie. If you pop them in the freezer, they don’t get melty, and then your guests will take a bite and will be totally surprised at the liquid chocolate inside <– that’s the Volcano part! 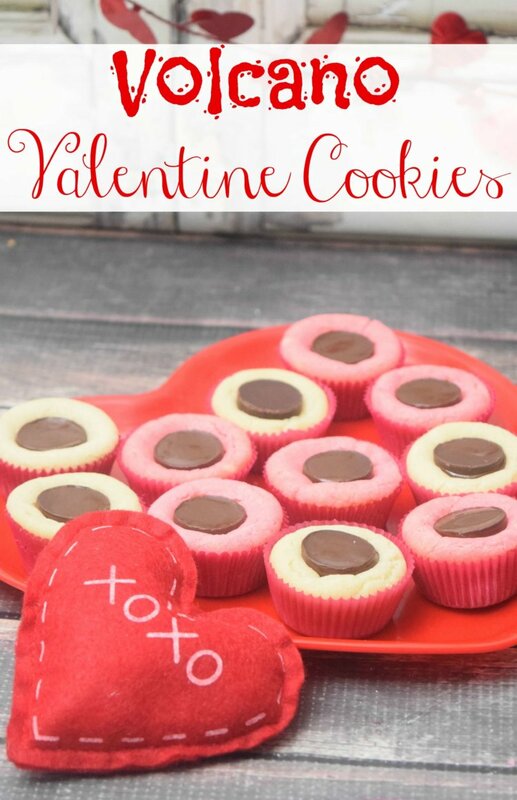 Here’s a nice view of a freshly sliced open Volcano Valentine Cookie! Doesn’t it look decadent? 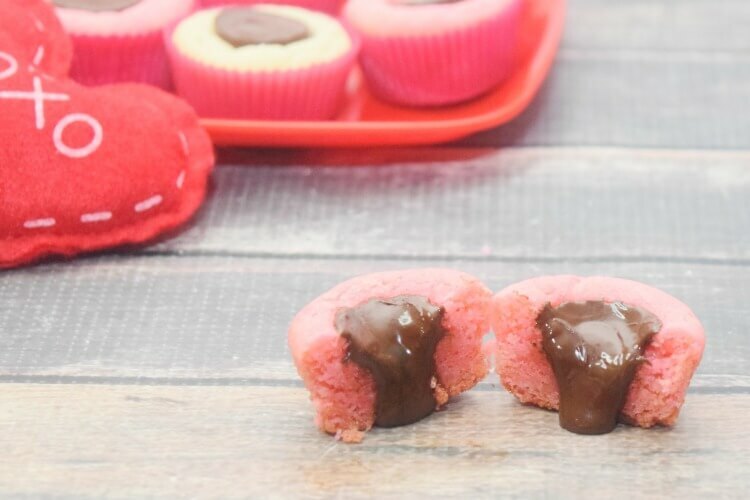 These Valentine Volcano Cookies are so simple to make and come out amazing! When you slice one open, it melts into delicious goodness. Prepare the sugar cookie mix with the egg and butter. Separate the cookie dough into 3 bowls. 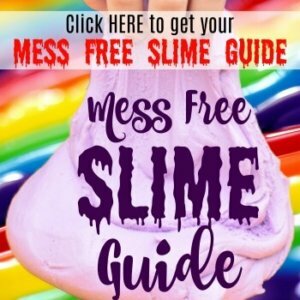 Add 5-6 drops of pink food coloring gel to one bowl. Add 6-8 drops of fuchsia food coloring gel to the second bowl. Keep the last bowl uncolored. Using disposable gloves, knead each cookie dough until the food coloring is completely mixed in. Cover and refrigerate each dough for about 30 minutes. 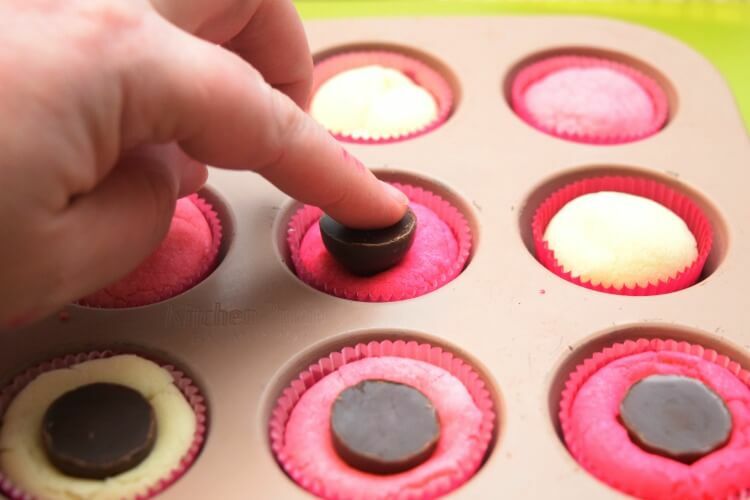 Add the mini cupcake liners to the mini muffin pan. Take about a tablespoon of dough at a time and roll it into a ball. Place each ball into a cupcake liner. While they are baking unwrap the HERSHEY’s Lava Cake KISSES. When the cookies are ready, remove from the oven and allow to cool for 2-3 minutes. 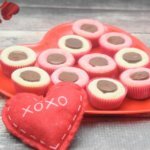 At the 2-3 minute mark, push an UPSIDE DOWN HERSHEY Lava Cake KISS into the center of each cookie cup. Pop them in the freezer for 5-10 minutes. Do not touch the cookies while they are cooling because the kisses will be very melty and easily can get messed up. You can use your favorite sugar cookie recipe OR you can just pick a mix up at the store….OR you can even buy refrigerated cookie dough and just knead in the food coloring.